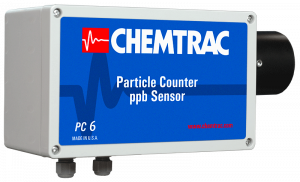 Particle Counter Sensor PC6 | Chemtrac, Inc. The HydroACT analyzer offers a wide range of customizable capabilities to suit any user’s requirements: from a basic analyzer with a single sensor and analog output to a more comprehensive solution consisting of a controller with multiple sensors, several chemical feed control outputs, and digital communications (Modbus or PROFIBUS). Other optional features include analog and digital I/O, data logging, and remote access over LAN or GSM modem. The versatility of the HydroACT platform helps ensure a more affordable and flexible solution by allowing the user to purchase only the specific hardware and firmware components that they actually need while allowing for upgrades to be performed at a later time if application requirements happen to change. The HydroACT analyzer is available in three versions. Each version offers different levels of I/O capability. 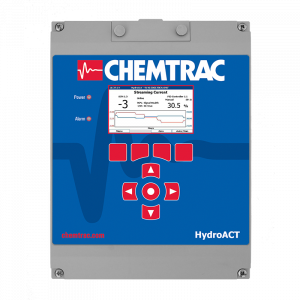 The PC6 Particle Counter Sensor, when combined with a HydroACT analyzer, brings many of the same great features of Chemtrac’s stand alone models (i.e. PC3400 & PC4400) to the HydroACT family of analyzers. PC6 allows the user to integrate multiple particle detection sensors into one analyzer or mix and match with other measurements of water quality like pH, chlorine, and UV254 organics. The PC6 also comes standard with volumetric concentration (ppb) measurement capability. For those users who prefer a single channel readout, the concentration display provides a more familiar measurement format (ppb). Changes in ppb accurately illustrate the impact from changes in particle concentration and particle size distribution. Full integration between the sensor and analyzer means all sensor settings, including user-friendly calibration features, can be accessed from the HydroACT’s user interface. A larger flow cell helps make this sensor easier to clean, and also reduces overall installation footprint due to the more compact flow control weir design. The PC6 has many potential applications and can be used virtually anywhere that there is a concern of potential contamination in a clean liquid. For very low levels of suspended solids, particle counting is quite often a better alternative to other traditional measurements like turbidity and SDI. Contact Chemtrac to discuss your application and let us find the right solution for you.